The global TNF inhibitors market was valued around US$ 40,369.8 Mn in 2017. It is anticipated to expand at a stable CAGR of 2.54% during the forecast period of 2018 to 2026, according to a new report published by Transparency Market Research (TMR) titled “TNF Inhibitors Market – Global Industry Analysis, Size, Share, Growth, Trends, and Forecast, 2018-2026”. Expansion of the global TNF inhibitors market is driven by strong research & development and increasing awareness regarding usage of TNF inhibitors for the treatment of various rheumatic conditions during the forecast period. 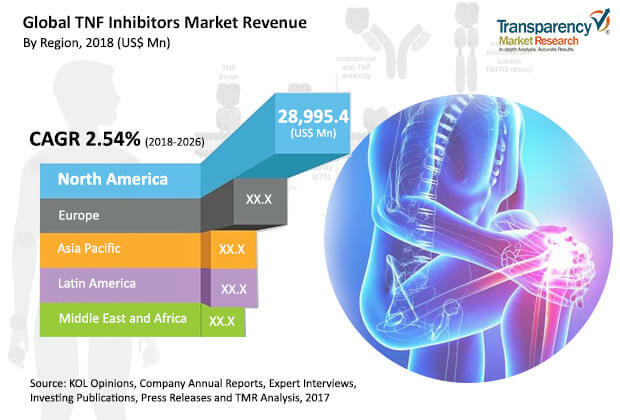 The TNF inhibitors market in Asia Pacific is expanding at a high CAGR of more than 4.5% due to the high prevalence of diseases, development in the health care sector, and increased adoption of TNF inhibitors due to entry of biosimilars. The global population is aging rapidly, especially in some developed economies such as the U.S., most of Western Europe, and Japan. Developed economies witness high rates of aging as compared to developing countries. This is attributed to improved health care infrastructure, reimbursement policies, and advancement in health care facilities in these countries. Moreover, access to various TNF inhibitors has improved in the recent past, especially in developed economies. This, in turn, has increased the life expectancy of the population. The geriatric population is a major end-user of TNF inhibitors for the improvement in the quality of their lives. Increase in number of elderly people leads to high rate of disease ailments, which in turn is likely to propel the demand and consumption of TNF inhibitors. Most leading TNF inhibitors such as humira, Enbrel, and remicade have lost their patents in the last few years and some TNF inhibitors are likely to lose their patents in the near future. Therefore, TNF inhibitors biosimilars are likely to gain market share during the forecast period due to patient affordability in low income countries and increase in patient awareness. For instance, the world bestselling drug, humira (adalimumab), lost its patent in 2016. Johnson & Johnson’s remicade lost its patent in 2014. Entry of TNF inhibitors biosimilars is expected to create lucrative opportunities in low income countries, making them more accessible and affordable, which in turn is likely to fuel the consumption of TNF inhibitors. This, in turn, is anticipated to further drive the TNF inhibitors market. Moreover, strong clinical pipeline of TNF inhibitors biosimilars further propels the global TNF inhibitors market. Based on distribution channel, the market can be segmented into hospital pharmacy, retail pharmacy & online pharmacy. The hospital pharmacy segment is estimated to hold a prominent share of the market during the forecast period, owing to the increase in number of hospital visits and stays. However, the online pharmacy segment is expected to expand at a high CAGR during the forecast period due to the increase in number of internet users and ease of usage. In terms of geography, the global TNF inhibitors market can be divided into major five geographical regions: North America, Europe, Asia Pacific, Latin America, and Middle East & Africa. North America is estimated to hold a leading share of the global market during the forecast period, owing to the high rate of adoption of TNF inhibitors and high health care expenditure in the region. Europe is anticipated to account for a significant share of the global market between 2018 and 2026. Increase in the incidence of rheumatic diseases in Europe is projected to fuel the market in the region during the forecast period. The market in Asia Pacific is projected to expand at a high growth rate during the forecast period, due to significant patient base, increasing health care expenditure, and availability of TNF inhibitors at a comparatively lower price, making them more accessible and affordable for patients. Increasing focus of key players on expansion in Asia Pacific’s large untapped population, and rising awareness about health care fuels the TNF inhibitors market in Asia Pacific. Key players covered in this report include AbbVie, Inc., Janssen Biotech, Inc., UCB, Amgen, Inc., Pfizer, Inc., Samsung Bioepis, Biogen, Merck & Co., and Takeda Pharmaceutical Company. Companies operating in the global TNF inhibitors market are focusing on strategic deals to maintain their market position and share by delaying the entry of biosimilars in major regions such as North America.